They look like modernist buildings! Talk about cakes, and we immediately think of frothy creations decorated with piped frosting, sugar cages, and mounds of whipped cream. But have you seen a cake that looks like a building that architect Santiago Calatrava designed, or a bonbon that resembles a tetrahedron? 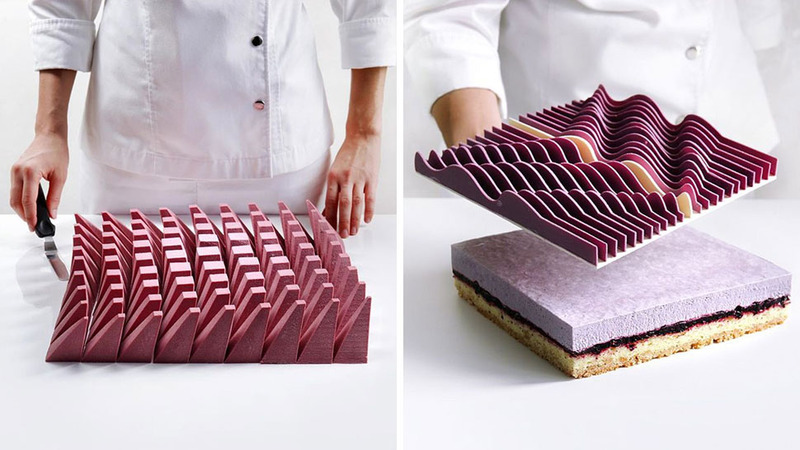 Ukraine Pastry chef Dinara Kasko produces such fantastic creations, and it isn’t a surprise, because she has a background in architecture and design. According to this article, Kasko uses her background in design and math to create unique molds for her pastries using a specialty software program and 3D printing. Another version of the “Mould Cloud” is a sponge cake with an apricot-kumquat-orange filling! Now take a look at the aptly named “Lime-Basil Triangulation.” Again, Kasko used 3D modeling and printing for the mould.